MY STORY– Who Am I? My Employment Visa Expires Before My Change of Employer Application Will be Finalised – Help! It can be an administrative nightmare when you find yourself in such a state of limbo. However, if you have no need to leave Hong Kong pending the outcome of your change of sponsorship application, ImmD have a very practical solution – assuming you submit your application to change employers BEFORE your current limit of stay expires…. “First may I say thanks for this resource online. I am close to the end of a one year Hong Kong employment visa (07-06-12). I left my old company as a financial adviser 3 months ago and now have a new job offer for 22-06-12 as a property consultant. So I am changing jobs AND applying for an extension at the same time I believe? At least that’s what my new company has told me. I have a background in mortgages in Singapore so financial advice and estate agency are in the ballpark of my skill-set. I just need to know which mistakes not to make. Is it a good or a bad sign that ImmD keep coming back with request for further information? Is 50 days a particularly long time to process a Hong Kong employment visa application? Will performance based equity compensation suffice instead of a cash salary for a Hong Kong employment visa? Can the sponsor of your Hong Kong employment visa hold your residence to ransom? The Hong Kong Visa Geeza (a.k.a Stephen Barnes) is a co-founder of the Hong Kong Visa Centre and author of the Hong Kong Visa Handbook. A law graduate of the London School of Economics, Stephen has been practicing Hong Kong immigration since 1993 and is widely acknowledged as the leading authority on business immigration matters here for the last 24 years. Will a Break in Continuous Employment Mean a Break in Continuous Residence For the Purposes of a Hong Kong Right of Abode Application? Is It Ever OK to Work in Hong Kong on a Visitor Visa? Half Way Through the Process, is it Possible to Cancel One Hong Kong Employment Visa Application to Start a Second One Instead? My Employment Visa Has Been Refused - What Can I Do Now? Has the Hong Kong Immigration Department Tightened Up On Applicants With Criminal Records Recently? How Do You Prove to the Hong Kong Immigration Department That You Have Tried to Recruit Locally? Can I Come to Install Equipment in Hong Kong Without an Employment Visa? Will My Hong Kong Employment Visa be Compromised If I Leave My Job Due to Intolerable Working Conditions? What's the difference between Unconditional Stay and Permanent Residence in Hong Kong? How Easy is it to Secure A Work Visa Issued Under the Immigration Arrangements for Non-local Graduates on the Basis of Freelance Employment? Will Vocational Rather Than Academic Qualifications Satisfy ImmD When Making a Hong Kong Work Visa Application? You Accidentally Overstay Your Hong Kong Employment Visa Yet Need to Change Employer - What Happens Now? Can I Go From a Hong Kong Investment Visa to an Employment Visa and Back to an Investment Visa Again? If I Hold an Employment Visa in Macau and Hong Kong Simultaneously But Live in Hong Kong Should My Wife Get a Dependant Visa for Macau too? Can I Set Up a Hong Kong Company, Employ My Business Partner & Sponsor an Employment Visa For Him? Can I Employ Myself by Getting a Hong Kong Business Investment Visa? Freelance Consulting in Hong Kong - Can You Get a Visa? How Can I Prove the Veracity of My CV for My Hong Kong Employment Visa Application if a Prior Employer is No Longer in Business? If I Live and Work in China But Have a Hong Kong Employment Visa Can I Get Dependant Visas for My Family? I Was Convicted of a Crime and Removed From Hong Kong - How Do My Visa Options Look Now? Do I Really Need an Employment Visa if I Get 6 Months' Visitor Status Upon Arrival & Intend to Work in Hong Kong for a Maximum of 2 Weeks? Can I Remain in Hong Kong as a Visitor After My Employment Visa Expires? What Pathways to an Employment Visa Exist For a Fresh, Foreign University Graduate Arriving in Hong Kong Seeking Career Opportunities Here? I Would Like to Apply for a Job Seekers Visa For Hong Kong - How Do I Go About Doing It? Is It a Good or a Bad Sign That the HKID Keep Coming Back With Further Requests for Information? Is There Any Fixed Residency Requirement for Retention of a Hong Kong Employment Visa? Can I Come to Hong Kong as Visitor, Find a Job, Then Change to an Employment Visa? I Want to Change Jobs With a Significant Reduction in My Base Salary - How Will this Impact on My Hong Kong Employment Visa Change of Sponsorship Application? What's the Deal if You're in Hong Kong With a Dependant Visa & Your Employment Visa Holding Spouse Wants to Leave but You Want to Stay? Long Term Business Visit to Hong Kong - Do I Need an Employment Visa? I Have a PRC National Spouse Resident on the Mainland - Can She Get a Dependant Visa for Hong Kong? Work in Hong Kong for 5 Years - Leave for 2 - Then Return - Will I Lose My Continuous Residence for PR Purposes? Will You Qualify for the Right of Abode in Hong Kong if it is Not Your Intention to Live Here Permanently? Please Don't Ask Me To Advise You On How To Break Hong Kong Immigration Law! Can a Hong Kong Training Visa Be Used As a Stepping Stone to a Full Employment Visa? Can I Work on the Side Under a Hong Kong Work Visa (Can I Have a Side Job)? What Visa Options Exist Where a Couple Have Met On-line & They Wish to Live Together in Hong Kong? How Does a Prior Bankruptcy Impact on Getting a Hong Kong Employment Visa? How Can a Defacto Spouse Gain Approval to Work Under a Hong Kong Prolonged Visitor Visa? Do I Need an Employment Visa Even if I Will be in Hong Kong for Just 2 Weeks to Complete a Consulting Assignment? Can I Look for a Job in Hong Kong and Attend Interviews If I Only Hold a Visitor Visa? Can I Do Business in Hong Kong Yet Live in Shenzhen to Save Costs & Commute Across the Boundary Each Day to Do My Business? What Chance is There That ImmD Will Grant a Visa to a Foreign National Who Previously Overstayed in Hong Kong by Five-And-A-Half Years? Hong Kong Immigration... What Does It Mean... Approvability Test? Will a Short Period of Time Away From Hong Kong Break My Continuity of Residence for My Eventual Right of Abode Application? Is it Legal for Company B to Hire Me Away from Company A (Assuming No Local Can Fill the Vacancy) & Apply For a New Hong Kong Work Visa Before the First Expires? How Can an Overseas Company Temporarily Sponsor Hong Kong Employment Visa Permissions? Do You Need a Hong Kong Employment Visa if You Work For a Hong Kong Company But Not in Hong Kong? Do You Need to Leave Hong Kong to 'Activate' Your Recently Secured Employment Visa Extension? Is It Ever OK to Work Full Time in Hong Kong Without An Employment Visa - For the Hong Kong Subsidiary of An Overseas Company? Is There Such An Animal As A " Flexible Working Visa " for Hong Kong? Can a Hong Kong Sole Proprietorship Form the Basis of a Self-Sponsored Change of Sponsorship Hong Kong Work Visa Approval? How Does Changing Industries Impact on Your Application to Change Hong Kong Employment Visa Sponsorship? How Can I Get the Approval of the Immigration Department to Change My Hong Kong Employment Visa Sponsorship Without My Current Employer Learning About It? How Can I Get a Visa & Work Legally in Hong Kong? Is it Ever Possible to Swap a Foreign Domestic Helper Visa into a Regular Employment Visa in Hong Kong? If My Hong Kong Training Visa Application is Denied Will I be Precluded From Visiting the HKSAR Subsequently? Do You Need a Visa to Operate a Business in Hong Kong if You Are Not Yet Resident Here? How is My Dependant Visa Affected Under the Mainland Talents & Professionals Scheme if My Sponsor Father Goes Back to China to Work? Hong Kong Work Visa - Is 2 Years Post Graduation Work Experience An Absolute Prerequisite? Can You Remain in Hong Kong Under an Employment Visa Sponsored by an ex-Employer & Run a Hong Kong Sole Proprietorship Providing Services Outside of Hong Kong (Mostly)? I Am a Multi-faceted Artist - What Type of Hong Kong Visa Suits Me Best? Must the Employing Company Sponsor of My Hong Kong Work Visa Application be Profitable? Can I Extend My Hong Kong Employment Visa if I Have No Job Presently But a Baby Born in Hong Kong? Do I Still Need a Hong Kong Working Visa if I've Been Placed on Gardening Leave? Can I Remain in Hong Kong as a Dependant Visa Holder if My Spouse Has Died? How Accommodating Are ImmD to Foreign National 'Job Hoppers' Seeking to Change Their Hong Kong Employment Visa Sponsorship All-Too Frequently? How Can I Resign From My Current Job BEFORE My Hong Kong Change of Employer Application Has Been Approved? Can You Work For a Single Client as a Pseudo-Employee Whilst Holding a Hong Kong Investment Visa? What Compliance Obligations Do I Have if I Hold a Hong Kong Employment Visa and Want to Start Freelancing After I Stop Working for My Employer-Sponsor? Which is Better - Apply for a Hong Kong Investment Visa Directly or for an Employment Visa First then after Approval Become a Shareholder in Your Own Business? In Hong Kong is it Possible to Get an Employment Visa to Work For Yourself and Also a Full Time Employer Both at the Same Time? Telecommuting From a Job in China AFTER a Hong Kong Employment Visa Refusal...? What Do the Immigration Department Look For When Establishing the Bones Fides of a Hong Kong Employer As a Suitable & Credible Sponsor Under the Immigration Arrangements for Non-local Graduates? Will Extended Time Spent in Hong Kong as a Visitor Between Employment Visas Negatively Impact Any Future Application I Make to Work Here Again? Hong Kong Employment Visa Holder - Join in a Side Business or Change Visa Category to a Full Investment Visa - Which is Better? Can You Hold a Hong Kong Employment Visa Yet Be Unemployed, Travel & (Even) Work Abroad for An Extended Period of Time Yet Still Qualify for the Right of Abode Here After 7 Years? Can I Get a Hong Kong Investment Visa if I'm Presently An Employee Seeking to Go Into Business With a New Partner? Can I Sponsor Myself for Freelance Work 'On-the-Side' Whilst Working For My Current Hong Kong Employment Visa Sponsor? Can I Still Get Permanent Residency in Hong Kong if I Lose My Job and My Visa Work Expires On Exactly the Same Day as My 7 Year Anniversary in Hong Kong? How Long Should You Wait After a Rejected Hong Kong Employment Visa Application Before Trying Again? How Do You Go About Changing Your Hong Kong Employment Visa Sponsorship at Immigration Tower? Can I Interview For New Job Opportunities in Hong Kong If I Hold a Temporary Training Visa Here? Hong Kong Employment Visa - Can I Transfer to Malaysia for Work Yet Leave My Family Behind in Hong Kong to Carry On Our Lives Here? Please Help Me Help You By Asking Hong Kong Immigration Questions I Can Actually Answer! Does Volunteering for a Good Cause Represent Unpaid Work Which Requires the Specific Permission of the Hong Kong Director of Immigration? How Do Brand New Businesses Establish Their Financial Bona Fides to be Deemed a Suitable and Credible Sponsor for a Hong Kong Employment Visa? Is There a Minimum Number of Days You Need to be in Hong Kong in Order to Maintain Your Investment Visa Status? Are Short Term Teaching Programmes Delivered by Non-resident Educators Subject to Normal Hong Kong Immigration Policy? Will a Criminal Record for Shoplifting Compromise Your Immediate and Long Term Plans for Residence in Hong Kong? What Does the Hong Kong Training Visa Actually Allow and What Do the Immigration Department Expect of the Parties to the Application? How Can I Handle My Hong Kong Employment Visa Extension If I Plan to Be On Leave For 8 Weeks Around the Time for Renewal? Will Performance-Based Equity Compensation Suffice Instead of a Cash Salary for A Hong Kong Employment Visa? Does the Hong Kong Employment Visa Change of Sponsorship Process Expressly Disclose to My New Employer the Reason For Me Leaving My Previous Job? Is 7 Weeks a Long Time to Wait For the Hong Kong Immigration Department to Finalize a Training Visa Application? What Kind of Visa Do We Need for a Technician to Undertake Highly Specialized 3D Scanning Work in Hong Kong That Will Last Only 10 Days? What Can I Do If My Employment Contract Ends on the Same Day as My Hong Kong Work Visa and I Need to Stay Here a While Longer to Sort Out My Affairs? What Types of Visa for the HKSAR Entitle You to Get a Hong Kong Identity Card? Can I Work in Shenzhen on My Hong Kong Employment Visa? New Graduate Management Trainee Position - Can You Get a Hong Kong Employment Visa? How Can I Go From Being a Sponsored Hong Kong Employment Visa Holder to Working in My Own Business as I Wait Out the 7 Years to Permanent Residency Here? Will My Frequent and Lengthy Visits to Hong Kong Over the Last 2 Years Compromise My Ability to Secure an Employment Visa Subsequently? What Chance of Approval for a 3-6 Month Intern Visa for Hong Kong & What Documents Are Needed? Does Time Spent Outside of Hong Kong Working For A Hong Kong Employer Break Continuity of Residence for PR Purposes After 7 Years? Can I Hold a Second Job While in Hong Kong Working Under a Training Visa? Can the Company You Have Just Left Contact Hong Kong Immigration And Make Your Visa Expire Immediately? Last 5 Years - the Top 10 Resources of the Hong Kong Visa Geeza Website & the Size of Our Tribe! 100% Hong Kong Visa Application Success Rate? Take It All With A Grain of Salt! What You SHOULD NOT DO When Renewing or Extending Your Hong Kong Working Visa! How Does Your Prior Immigration Record in Hong Kong Impact On Future Visa Applications Here? Can You Use the Foreign Domestic Helper Visa to Employ Your Mother in Hong Kong? Can I Still Sponsor a Hong Kong Dependant Visa for My New Wife If I Hold an Employment Visa But Am Presently Between Jobs? As a Hong Kong Work Visa Holder, If I Own Shares in a Company Here Will It Disqualify Me From Getting a Student Visa? Is There Such an Animal as a Hong Kong Employment Visa for an Independant Contractor? What Happens to My Girlfriend's Hong Kong Employment Visa if She Quits Her Job and We Get Engaged - Can She Carry on Working on the Strength of Our Relationship? Can I Use the Impending Expiry of My Hong Kong Work Visa as a Way to Force the Early Termination of My Employment Contract? How Can I Manage the Expiry of My Hong Kong Employment Visa With My Intention to Resign From My Job & Start My Own Business Here? Can I Study then Get Married All Whilst Holding a Hong Kong Employment Visa Sponsored by a Company I No Longer Work For? Hong Kong Visas For 2 Week Visitor Nationals - Work For Yourself Or Someone Else? Now That I’ve Lost My Job What About My Hong Kong Work Visa? Will I Get Kicked Out of the HKSAR? How Hard is it to Transfer From a Hong Kong Working Holiday Visa to a Full Employment Visa? Hong Kong Working Visas - Is it Possible to Build a New Business Here Relying Solely on Highly Specialist Foreign National Skills and Talent? Hong Kong Immigration... What Does It Mean... Swapping Status? Hong Kong Immigration... What Does It Mean... Contrived Employment? Hong Kong Immigration... What Does It Mean... Administrative Flux? What's a Suitable Hong Kong Visa & Immigration Strategy for a Highly Accomplished Professional Trailing Unmarried Partner? Should I Change My Hong Kong Visa Category From Sponsored Employment to Business Investment or Seek Permission to Join in a Side Business Instead? But Stephen, How Do You Make Any Money When You Give All Your Hong Kong Visa Expertise Away for Free? Fame At Last... the Hong Kong Visa Centre as a Classic Seth Godin Case Study! Can a Non-Graduate Get a Hong Kong Work Visa to Work as a Language Teacher? Can I Apply to Extend My Current Hong Kong Work Visa At the Same Time as I Apply for a Change of Employer? Can You Improve Your Chances of a Successful Hong Kong Work Visa Application By Contriving an Interim Intercompany Transferee Scenario? QOTW: Will My Hong Kong Work Visa Change of Employer be Denied If My Fixed Compensation is Significantly Less Than in My Current Role? Can You Have 2 Hong Kong Employment Visa Applications Pending At the Same Time? Do You Need a Degree to Get a Hong Kong Work Visa? I Have Been Made Redundant But Have 12 Months Left on My Hong Kong Work Visa - Can I Stay Here and Look for Another Job? Is it Better to Apply for Your Visa Before or After You Move to Hong Kong? Can You Expect ImmD to Readily Approve a Hong Kong Work Visa Application Just Because the Applicant is a Child of the Owner of the Sponsoring Business? Is it True that Getting Your First Hong Kong Employment Visa is the Hardest then Afterwards It's a Cinch to Swap Over to Any Other Employer? What Can I Do To Maintain My Eligibility for Right of Abode in Hong Kong Now That I've Been Made Redundant? Employment in Hong Kong as a Professional or an Imported Worker - Which Are You? Do I Have to Terminate My Current Job if My Future Employer is Applying for My Hong Kong Work Visa Change of Sponsorship? Can You Leave Hong Kong to Pursue an MBA Overseas & Not Lose Your Continuity of Ordinary Residence if You Intend to Go On to Secure the Right of Abode in Hong Kong? How Can I Best Manage the Hong Kong Work Visa Implications of Changing Employers When I Have Just a Few Weeks Remaining On My Current Limit of Stay? Will Redundancy & Subsequent, Extensive Overseas Travel Away Negatively Impact a Hong Kong Permanent Residency Application at the 7 Year Mark? Can You Get A Work Visa to Teach English in Hong Kong if You Don't Have a University Degree? Hong Kong Immigration... What Does It Mean... Suitable & Credible Sponsor? Hong Kong Immigration... What Does It Mean... One Year Rule? How Can You Extend Your Hong Kong Work Visa if Your Passport Is About to Expire? Can I Easily Swap From a Working Holiday Visa to a Hong Kong Work Visa? Hong Kong Immigration... What Does It Mean... Visa Gossip & Rumours? Can I Get a Short Term Extension to My Hong Kong Dependant Visa? Hong Kong Immigration... What Does It Mean... Twilight Zone? QOTW: What Happens to Your Hong Kong Dependant Visa if Your Spouse is Made Redundant? Can I Quit My Job Just Before My 7 Year Anniversary to Work Overseas & Still Quality for PR in Hong Kong? I Have Been in Hong Kong For 2 Years as a Visitor and Have 2 Work Visa Refusals - What's the Risk of Refused Entry Again in My Circumstances? QOTW: If I Get a Hong Kong Investment Visa Can I Consult to a Single Client Only as a Pseudo-Employee? How Will Bankruptcy While Living Here Impact the Possibility of Hong Kong Work Visa Extension? LIFTING THE LID: What Would It Take For the Hong Kong Visa Centre to 'Fire' a Client? QOTW: Can You Take Up Short Term One-Off Employment in Hong Kong on a Visitor Visa? 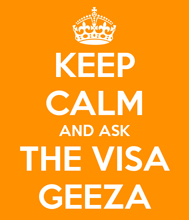 LIFTING THE LID: How Do You Manage to Keep the Hong Kong Visa Geeza Blog Up-to-Date? What Exactly Do You Need to Include in a Visa Application to Join in a Side Business in Hong Kong? QOTW: Can You Stay As a Visitor While Processing a Hong Kong Work Visa Application? LIFTING THE LID: How Does It Work With Josephine Lau, Centre O Connect & The Hong Kong Visa Centre? QOTW: Do You Need an Employment Visa to Deliver a Short Term Training Programme in Hong Kong? 4 - How to Apply for a Hong Kong Work Visa Without Paying for Professional Help - Are You a Professional? 2015 Hong Kong Immigration Policy Update - Earthquake or Tremor? Can You Keep Your Hong Kong Employment Visa if You Are Being Transferred to Live & Work in China? QOTW: How Are Mainland Applicants for Visas Issued Under the Hong Kong General Employment Policy Treated Differently From Other Foreign Nationals? LIFTING THE LID - What's it Like Operating the Hong Kong Visa Centre as a Virtual Business? How Much & What Type of Work Experience Post-Graduation is Actually Needed to Get a Hong Kong Work Visa? LIFTING THE LID - How Important Are Word of Mouth Referrals to the Hong Kong Visa Centre? How to Apply For a Hong Kong Investment Visa Without Paying for Professional Help - 6 - Work Visa vs Investment Visa? QOTW: Can I Get A Hong Kong Work Visa With No Degree? How Does Time Spent Between Residence Visas Impact on Your Eligibility for the Right of Abode in Hong Kong Subsequently? QOTW: Will a Short Term Work Visa for Hong Kong be Cancelled if the Holder Activates it But Doesn't Actually Take Up the Employment Until Just Before It is Set To Expire? How Do I Go About Setting Up a Side Business to Complement My Full Time Hong Kong Employment Visa? You've Lost Your Job: Can You Get an Interim Hong Kong Employment Visa Extension While You Continue Looking for a New Employer? QOTW: Swapping to a Hong Kong Employment Visa from a Working Holiday Visa - Possible? QOTW: Can I Easily Swap Back to a Hong Kong Investment Visa from an Employment Visa Once Again? Is It Possible to Change Employment Visa Sponsorship Where the Employer Has Not Yet Established a New Company in Hong Kong (i.e. Has No Business Operations Here Yet)? If You No Longer Work for Your Sponsoring Employer What Impact Will This Have on Your Hong Kong Right of Abode Application? QOTW: Can I Still Work if My Hong Kong Employment Visa Extension is Under Processing But My Previous Limit of Stay Has Expired? QOTW: Do You Need to Have a Job in Hong Kong to Be Able to Sponsor a Dependant Visa for Your New Spouse? Does the Hong Kong Immigration Department Positively Consider Family Reunion as a Factor to Employment Visa Grant? QOTW: How Easy (or Hard) Is It to Swap From a Hong Kong Working Holiday Visa to a Full Employment Visa? Can You Expect the Hong Kong Immigration Department to be Flexible in a Work Visa Application if You Expect to Qualify for the Right of Abode a Few Short Weeks Later? Training, Employment or Working Holiday - What's the Best Hong Kong Visa Option for a Recently Graduated British National? From Eel Farms to Chicken Sexing - All In a Day's Work for the Hong Kong Visa Geeza! Interview: We Have 20,000 Vacancies in the F+B Industry But We Don’t Have People to Fill These Jobs – What Are the Hong Kong Immigration Department Doing About It? Interview: Has Hong Kong’s Effort to Forge a Particular Social Fabric Through the Constructs of its Immigration Policy Been Successful Do You Think? How Can Hong Kong Technology Startups Improve Their Chances of Winning Investment Visa Approvals for Their Founders? Why Do Hong Kong Technology Startups Mostly Struggle to Win Investment Visa Approvals for Their Founders? QOTW: Can I Get an Employment Visa Again if I Still Owe Taxes From the Last Time I Worked in Hong Kong? QOTW: Do I Really Need an Employment Visa if I Get 6 Months' Visitor Status Upon Arrival & Intend to Work in Hong Kong for a Maximum of 2 Weeks? What Are the Obligations of an Employer to a Prospective Employee When an Application for a Hong Kong Work Visa Has Been Refused? Interview: Do You Think the Relatively Low Number of Foreigners Coming to Live and Work in Hong Kong is Due to it Being Hard to Get a Visa? Interview: Is There a Threshold to Attaining a Hong Kong Work Visa Under the General Employment Policy? Do Immigration Consultants Add Any Value to the Hong Kong Visa Process? Relocating to Hong Kong For Work or Business - Why Do Visa Applications Get Denied? I Have Technically Overstayed My Hong Kong Employment Visa by One Day But Have No Job - What Happens Now? I Have a Hong Kong Employment Visa to Take Me Through to 7 Years But Now I'm Unemployed - Can I 'Cruise' the Last Year Without Working and Still Qualify for Permanent Residency? Interview: Do You Think that IANG Allows a Loophole for Foreign Graduates to Game the Immigration System Here? Which is Better - Change of Hong Kong Employment Visa Sponsorship or Seeking to Swap Over to a QMAS Visa Instead? Interview: In Real Terms What is the Difference Between the General Employment Policy and the Admission of Mainland Talents & Professionals Scheme? Can I Easily Return To (and Then Remain In) Hong Kong as a Visitor Once My Current Employment Visa Has Expired? Interview: Has Hong Kong Ever Been Used as a Kind of Stepping Stone Into Another Immigration Jurisdiction? Interview: In the Last 20 Years Which Type of Hong Kong Visa Has Been Most in Demand and the Easiest to Anticipate an Approval For? How Hard Is It to Secure A Visa Extension as an 'Investor' Under the Hong Kong Immigration Arrangements for Non-local Graduates? Interview: Is the Hong Kong Immigration Department Website Actually Fit For Purpose? How Can I Prove to the Hong Kong Immigration Department My Last Day of Work for My Previous Employer as Part of My Change of Employment Visa Sponsorship Application? Interview: Do Mainlanders Typically Enjoy the Same Kind of Immigration Experience as Other Foreign Nationals Do in Hong Kong? Interview: What Was It Like Being An Immigration Consultant in Hong Kong During the Time of SARS? Will the Immigration Department Extend My Employment Visa if I Am Subject to a Police Investigation? Can You Continue to Work If You Find Yourself In the Hong Kong Visa Extension Twilight Zone? Can an Offshore Company Sponsor a Hong Kong Employment or Business Investment Visa? Is It Possible to Cancel a Hong Kong Visa Application and, If So, How Do You Go About Doing It? Am I Compelled to Apply for Hong Kong Permanent Residency After 7 Years or Can I Maintain the Status Quo of My Present Employment Visa? Can I Apply for Right of Abode if My Employment Visa Expires on the Exact 7 Year Anniversary of My Residence in Hong Kong But I Have No Job on That Date? What About Your Hong Kong Employment Visa If You’re Thinking of Changing Jobs? Why Don’t Immigration Consultants Typically Help Aspiring Employees Find Jobs in Hong Kong? If I Stop Working for My Current Employer Will My Hong Kong Employment Visa Remain Valid? I Have Been Made Redundant But My Wife is Working - Can We Swap Our Hong Kong Employment and Spouse Visas Around So I Can Become Her Dependant in Hong Kong? What Do You Need to Do If There Has Been a Change in the Details of Your Hong Kong Employment Visa Sponsor But No Change in Your Employer? What Type of Visa Do You Think You Need for Hong Kong? What Happens if You Inadvertently Breach Your Conditions of Stay by Taking Up an Unauthorised Employment in Hong Kong Without First Applying for a Change of Sponsorship? I Will Only Be Working in Hong Kong For 6 Weeks – Should I Bother Getting an Employment Visa? What Happens if You Overstay Your Hong Kong Visa Limit of Stay? What Do Both Hong Kong Employment & Investment Visa Applications Share In Common? I Worked in Hong Kong for 4 Years - then Left for 2 - and Have a Valid Visa in My Passport - Can I Still Work & then Apply for PR? Is it Ever Possible to Extend a Hong Kong Training Visa? How Flexible is the Admission of Mainland Talents & Professionals Scheme in Enabling Chinese Nationals to Come & Work in Hong Kong? How to Get a Hong Kong Working Visa Automatically - With No Questions Asked! What Are the Chances of Swapping from a Training Visa to an Employment Visa For the Same Employer Once the Period of Training is Over? Checking the Status of Your Hong Kong Visa Application On-Line.....Yeah Right! Is It Actually Becoming Harder to Get Your Hong Kong Employment or Investment Visa Approved? Is It Possible for an SME to Sponsor a Work Visa for a Foreign National Employee in Hong Kong? Sometimes Large Employers Experience Hong Kong Employment Visa Refusals Too – Why Might This Be So? Why Do Some Hong Kong Visa Applications Take Months to Finalise (if Ever)? Is the Hong Kong Immigration Department Website Actually Any Use to Visa Applicants? I Have Lived in Hong Kong for 5 Years. Can I Extend My Work Visa for 2 Years, Quit My Job, Study Full-Time, then Apply for RoA? Getting a Working Visa for Hong Kong is a Simple Matter of Filling in the Forms, Right? What's the Deal About Advertising Your Job Locally Before You Can Apply for an Employment Visa in Hong Kong? How Will Your Employment Visa Application be Impacted if the Hong Kong Company Employing You is New? The Shiny New D-I-Y Hong Kong Visa Kit - Get Yours Today - 100% FREE! The Hong Kong Immigration Department Official Video - Almost 10 Minutes of "Why Bother"? I Hate My Boss & Want to Leave My Job - What About My Work Visa for Hong Kong? What Hong Kong Visa Options Exist for Unmarried, Trailing Partners? What's the Story When You Hold a Hong Kong Work Visa and Face Redundancy? Are There Any Advantages to being an Existing Resident of Hong Kong When You Make an Application for an Investment Visa? Will a Criminal Record Impact on Your Application for a Hong Kong Residence Visa? I am an Independent Contractor Not an Employee - Can I Get an Employment Visa as an Intercompany Transferee? Hong Kong Visa Extension Advice & Assistance - 100% Free! Your Employer Must Help You Get Your Hong Kong Employment Visa! Hong Kong Employment Visa - When All Else Failed We Appealed to the Chief Executive - And Won! Work Visas: Does Your Employer Control Your Hong Kong Immigration Destiny? The Hong Kong Visa Handbook - Now Available in Good Book Stores Everywhere! What Are You Really Buying From a Hong Kong Immigration Consultant? Hong Kong Employment Visa - Teenage High School Graduate Gets Approved! How to Stop Worrying About Your Hong Kong Visa & Start Applying! How to Cure Your Hong Kong Visa Extension Headache & Make Sure it Gets Approved the Very First Time! What’s the Minimum Salary for a Hong Kong Employment Visa Approval? If I Didn't Graduate from University, Will it Stop Me From Getting a Hong Kong Employment Visa? What's the Basic Income of a Typical Hong Kong Employment Visa Holder? Can I Apply for a Residence Visa for Hong Kong While I Am Visiting? Your Hong Kong Employment Visa - What Happens When You Lose Your Job? Can I Apply for a Visa After I Have Moved to Hong Kong or Should I Apply Beforehand? Is There a Base Salary Requirement for a Hong Kong Employment Visa? I've Lost My Job - What Happens to My Hong Kong Employment Visa? Hong Kong Employment Visa - Do You Need a Degree?